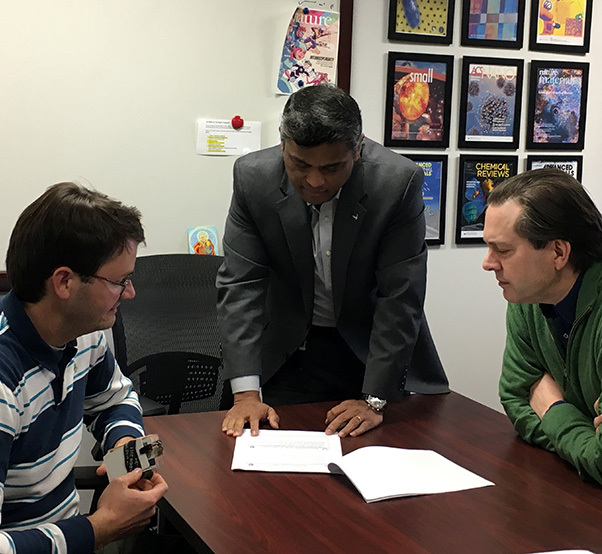 AFRL project researchers Dr. Joseph Slocik (left), Dr. Rajesh Naik, and Dr. Patrick Dennis review the recently-signed licensing agreement that grants locally-based innovators S.A.Wyze exclusive rights to use AFRL-developed Ultra-Stable Antibody Liquids technology for human diagnostic work. When large groups of people are suddenly cut off from electricity, shelter, and medical supplies, the initial crisis may be only the tip of the iceberg. Sanitation issues, disease and physical fatigue are among the many widespread and lingering problems that may arise from poor conditions. AFRL, along with Dayton-based innovators, S.A.Wyze (Situational Awareness Wisdom) hope to help alleviate this suffering with the help of Ultra-Stable Antibody Liquids. These unique antibodies, developed by an in-house team of AFRL researchers, are shelf-stable and easily transportable, which could translate to vast improvements to medical diagnostics and treatment in remote and disaster-stricken areas. Traditional antibodies—proteins that are the vital component in vaccinations, therapeutics, and medical diagnostics—are extremely sensitive to temperature and can quickly degrade and become ineffective if not refrigerated properly. In fact, some types of antibodies are so sensitive that they require very precise sub-zero Celsius storage temperatures. This volatility makes them extremely difficult to transport, store and deploy in the field, particularly in remote or isolated areas. While working on an unrelated biological materials project funded by the Air Force Office of Scientific Research, the AFRL research team of Dr. Rajesh Naik, Dr. Patrick Dennis and Dr. Joseph Slocik discovered the protein liquids they were developing displayed some unique properties that could greatly improve the stability of antibodies as we know them. “The biggest thing about these antibody liquids is that they’re extremely stable, so you can heat them up to hundreds of degrees and they’re still active and they still maintain their structure,” said project researcher Dr. Joseph Slocik. He explained that the AFRL team developed this material by removing all water from the antibodies, while preserving the protein structure and function. Doing so allowed the modified antibodies to retain the same binding properties as traditional antibodies, but without refrigeration. Slocik added that the antibodies displayed other useful characteristics as well. They are viscous in nature, so they can be stamped or printed for precise placement for use in biosensors or diagnostics. 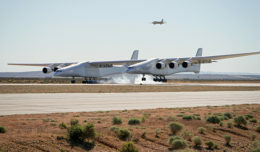 Recognizing the vast potential of these unique materials, the AFRL Materials and Manufacturing Directorate Technology Transfer office, led by Sunita Chavan, coordinated with the project researchers to investigate its potential transition for real-world commercial use. “Our goal is to take innovation beyond the laboratory. If we see a dual-use potential—meaning our technology can be used not only for military purposes, but for commercial uses as well—we will pursue that,” Chavan said. She explained that through cooperative partnerships with commercial researchers, the capabilities of AFRL technologies can be fully unleashed, leading to better products for both military and commercial purposes. Through Wright Brothers Institute, a Dayton-based company that works closely with AFRL to facilitate technology transfer, Chavan connected the AFRL team with the entrepreneurs at S.A.Wyze (a joint venture with SP Global, Inc.), who saw potential in using the unique antibodies for their efforts to create low-cost, sustainable technologies for detecting and controlling infectious disease. “Upon meeting [the AFRL team], we were impressed with their prior lab work, noting that their success in detecting antigens was a great foundation for detecting other targets,” said Dalton Pont, president of S.A.Wyze. “The key for us was to have a diverse capability which could be used for many purposes, yet is practical for our use cases.” He added that the S.A.Wyze team quickly recognized the collaborative spirit that existed between the two groups and knew it could be a good collaborative venture. AFRL and S.A.Wyze entered into a licensing agreement giving S.A.Wyze exclusive rights to use the AFRL technology for human diagnostic work. In addition, the two entities signed a Cooperative Research and Development Agreement, through which they will share resources and expertise, and protect intellectual property, thereby expediting the commercialization process. S.A.Wyze is currently in the process of putting the AFRL-developed antibody technology to use by developing and maturing a low-cost, disposable, health-monitoring wristband that can monitor and collect real-time health data such as vital signs and the presence of bacteria and viruses. The wristband will be able to be distributed to people in need, and data can be collected with a mobile app to be analyzed for both individual concerns and population trends. The wristband concept enables medical and aid workers to easily and inexpensively reach people to meet more needs, more quickly. It also eases the stress, fatigue, and exposure risk for responders. In June, the S.A.Wyze research team, which includes personnel from SP Global, Key Electronics, Dayton-based EMITTI, and Purdue University, deployed a fully-functioning prototype into Cameroon as part of a technology assessment mission. The company expects a first-generation wristband unit to be ready in January 2018. 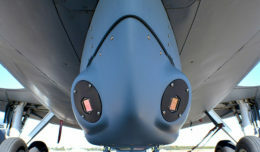 For AFRL, teaming with Wyze offers a win-win opportunity to continue the development and application of this technology, which could benefit warfighters in the field in years to come. According to Chavan, AFRL may consider other licensing opportunities for the Ultra-Stable Antibody technology in the future. By licensing it for this and other applications, AFRL stands to more broadly expand the scope of the technology and benefit from the resulting lower production costs. “It is a way to serve the war fighter while offering benefit for humankind,” said Chavan.